You may soon see a new fee on your credit card purchase receipt, if haven’t seen already, thanks to a $6 billion settlement reached last July between major credit card issuers and merchants. The proposed settlement was the result of an antitrust lawsuit filed against credit card transaction processors Visa, MasterCard, and other nine major banks for fixing credit card processing fees. As we know, every time we use a credit card to pay for our purchase, a certain amount of fee, the so-called swipe fee, is paid to banks and Visa and MasterCard for processing the transaction. As a consumer, I enjoy the convenience of being able to pay my purchases with plastics, but for merchants that accepting credit card payment, the swipe fee, usually ranging from 1.5 to 3 percent of the total transaction amount, is an additional cost that erodes their profits. The settlement won preliminary court approval in November 2012 and, as part of the settlement, Visa, MasterCard and other major issuers, such as JPMorgan Chase and Bank of America, agree to reduce the credit card swipe fees, but only for the period of the eight months. This means that at the end of the eight-month period, which was late January, the temporary reduction no longer exists and swipe fee returns to the previous level. The settlement also gives retailers the option to add a surcharge to offset the 1.5% to 3% swipe fee to the price paid by consumers. Before the lawsuit and the subsequent settlement, credit card payment processing companies actually prohibit merchants from charging their customers more for using credit cards to pay for the purchases. But under the settlement, that ban is removed, freeing merchants to add a surcharge to the retail price and pass the additional cost on to us, the consumer. While the possibility is there for retailers to add the surcharge, they do have to do it in a way that we know the price we pay now consist of the surcharge in they choose to do so. The merchants are required to state clearly at the entrance of their store or on their website that they are now charging the surcharge, which also must appear on the receipt. 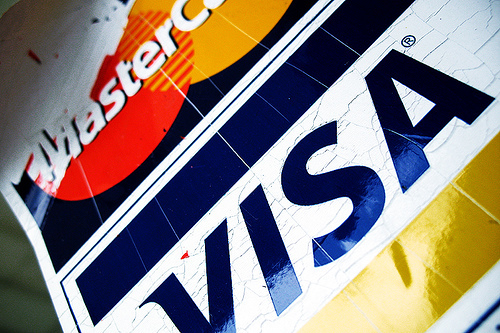 I am a credit card person and always prefer to pay with credit cards than any other payment methods. However, I don’t like the idea of retailers passing the additional fee to me. If I see a store has a notice on its door that says it is adding a 3% surcharge to the price due to this settlement, I will just walk away and refuse to shop there, even if the surcharge is supposed to protect the merchant from credit card companies. It’s a competitive economic environment and I am pretty sure I can get the same product from somewhere else that doesn’t charge the extra. BTW, if you are living in one of these ten states, California, Colorado, Connecticut, Florida, Kansas, Maine, Massachusetts, New York, Oklahoma, and Texas, then you don’t have to worry about this new fee because it is still banned.